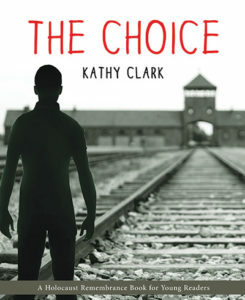 Part of Second Story’s “Holocaust Remembrance Series for Young Readers,” The Choice is a novel inspired by the experiences of Kathy Clark’s family in wartime Hungary. Near the end of the Second World War huge numbers of Hungarian Jews were rounded up by the Nazi occupation force, assisted by local Arrow Cross supporters, and then shipped to concentration camps. Hendrik (based on the author’s father, Frigyes Porscht) attends a Franciscan-run school in Budapest and is the protagonist of this work. In the story his original name is Jacob Kohn and, while he has lived for five years as a Christian, his family is actually of Jewish origin. A trip to the ghetto to visit his aunt Mimi leads Jacob to reveal his real background to authorities, setting off a series of horrific consequences. The day-by-day account of life in Auswitchz and its associated Arbeitslager Blechhammer oil refinery work camp includes incredible hardships as well as various survival strategies. Finally liberated by the Red Army in late February 1945, Jacob discovers most of his immediate family has been rescued by Raoul Wallenberg, and eventually they embark for Canada. Classroom Connections: Aimed at readers aged 9 to 13, this well-written story should captivate many young minds. There are historical explanations offered, a map and photographs of key places are included, and the story is both exciting and believable. Depending on the level, it could be a class novel or read independently, and it offers the view of a youngster from another time, providing teachers the chance to discuss perspective, assumptions and biases. Most elementary school students are naturally interested in the concepts of identity, friendship and diversity—and wish to have critical discussions about them—and these themes run throughout this historical novel.